Jesus' baptism was a major turning point in his life, but it would come to signify so much more. Let's discover how to truly obey the Lord. Please read John 3:22-36 before starting GraspingGod.com's free Bible study lessons, #2.06. 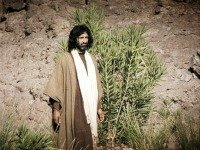 Don't miss the previous lesson: Life of John the Baptist, Lesson 2.05. 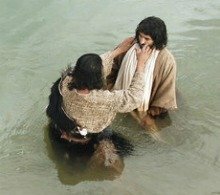 1) Why was Jesus baptized? 2) Who administered Jesus' baptism? 3) Jesus' baptism foretold his death, burial and resurrection. How does baptism picture those things? The baptism of Jesus is an important turning point in Jesus' life. Up to this point he had been living in relative obscurity, and we know precious little of his life prior to this event. He left his modest Nazareth home for the Jordan River on this day, and the rest is history. Let's study Jesus' baptism and dig up some neat things. Before moving ahead in this lesson, let's define baptism, in case you're not sure exactly what it is. An online dictionary gives this overly brief and simple definition of baptism: "A ceremonial immersion in water, or application of water, as an initiatory rite or sacrament of the Christian church." Today's churches perform the rite in different fashions, but that's a lesson for another day. John the Baptist was preaching repentance and baptism for the forgiveness of sins, which was being responded to by multitudes of Jewish believers. Repentance means that the people were listening to God's word, admitting and confessing their sins, and committing their lives to God's law. Finally, they were immersed by John the Baptist into the waters of the Jordan River. John the Baptist was preparing the people for the coming Messiah. Lo and behold, the coming Messiah approached the Jordan River one day. John the Baptist was shocked! Jesus didn't need to repent from anything, since he never sinned. 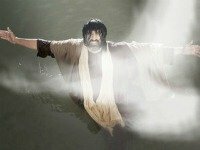 Why was Jesus coming to the river? Let's look at what transpired at the baptism of Jesus. Jesus' baptism introduced his public ministry, so we know he was almost 30 years of age. He didn't have to be baptized because he wasn't a sinner. He was also fully committed to God the Father. 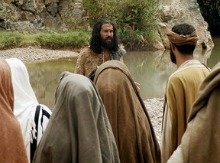 However, for perfect obedience to his Father, he needed to be baptized. God expected Jesus to fully identify with humanity. For Jesus to be our substitute for sin - our sacrifice - he had to perfectly identify with us. John didn't clearly understand this, at first, however after Christ explained that it was necessary, he gladly performed the ceremonial baptism (Matthew 3:13-15). John baptized Jesus, and said, “Behold, the Lamb of God who takes away the sin of the world!" John introduced Jesus as the Lamb of God. This wasn't a new concept in Judaism, because there was a sacrificial lamb standing in for Isaac when Abraham offered a sacrifice to the Lord; the Passover Lamb was needed by the Hebrews in Egypt in order to save their firstborn sons; and Isaiah peered into the future and saw a silent, innocent Lamb being led to the slaughter (Isaiah 53:7). Now, after all these centuries, John the Baptist introduces the long-awaited Lamb of God. The last part of John's proclamation is especially striking. He strongly emphasized that this Lamb "takes away the sin of the world!" Wow! Jesus takes our sins away. He deposits them into the depths of the sea (Micah 7:19). Jesus puts them behind his back (Isaiah 38:17). He sends them as far away as the east is from the west (Psalm 103:11-12)! This Lamb of God frees a soul from the sins that separate him from God. Once your sins are forgiven they are completely forgotten by God (Isaiah 43:25)! This was John the Baptist's remarkable testimony to those who would listen, of which many Jews did. We have a God who loves us so much. Thinking about his forgiveness drops me to my knees in thanksgiving and praise. Please take a moment and do the same if you feel God drawing you (James 4:8). First, Hebrews 2:17 says, "Therefore, it was necessary for him to be made in every respect like us, his brothers and sisters, so that he could be our merciful and faithful High Priest before God. Then he could offer a sacrifice that would take away the sins of the people." The way in which God demanded people to respond to him is what he also expected of Jesus. As stated previously, Jesus' baptism was essential so that he fully relates to us - he identifies with us (Isaiah 53:11; 1 Peter 3:18). Baptism wasn't the only "human" act of worship Jesus performed. He also instituted communion, prayed, he sang psalms, studied and taught the Scriptures, served the Father, suffered because of his faith, etc. Jesus Christ is definitely our supreme example! Second, the baptism of Jesus Christ was a transition point between his private life and public ministry. This ceremony was the final day of Christ's life as a virtual unknown, and the first day of his high profile public ministry. The baptism of Christ was an event that set Christ apart for his powerful ministry. His time was now at hand. Third, Jesus' baptism pictured his death and resurrection (Luke 12:50). The baptism found Jesus being lowered into the water, which pictures death and burial; and, rising up from the water picturing a new life found in the resurrection. 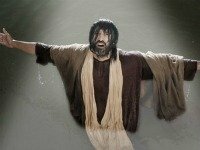 Jesus' baptism prefigures the significance of our own Christian baptism (Romans 6:3-5; Colossians 2:12). Fourth, God the Father audibly spoke for the first time in centuries at Jesus' baptism. He said, “This is my dearly loved Son, who brings me great joy.” (Matthew 3:17). This statement revealed the Father's stamp of approval of Jesus being our sacrificial Lamb. It verified Christ as our Savior, because of who he was - the Son of God, and the fact he was sinless. Jesus qualified as our sacrifice, which is something no one else could ever do. Finally, Luke 3:22 tells us, "The Holy Spirit, in bodily form, descended on him like a dove." This is no small matter. The fact that the Holy Spirit fell upon Christ, tells us the work of redemption is performed by the Spirit of God. When the Holy Spirit descended upon Jesus, he did so without measure. John 3:34 says, "For he is sent by God. He speaks God's words, for God gives him the Spirit without limit." Normally, sinful people under God's powerful Spirit somewhat block his power, because of personal sin. But, because of the sinlessness of Christ, the Spirit had full effect on his ministry. God manifested his full power through Christ, at this point in time. This same Holy Spirit descends upon us when we repent of our sins, and believe in God through his Son, Jesus. The apostle Paul states in Ephesians 1:13-14, "In Him, you also, after listening to the message of truth, the gospel of your salvation — having also believed, you were sealed in Him with the Holy Spirit of promise, who is given as a pledge of our inheritance, with a view to the redemption of God’s own possession, to the praise of His glory." It's hard to believe that God gives us the same Spirit that he gave his beloved Son! If we look upon both the baptism of Jesus, and our own spiritual rebirth, do we not see the Spirit as a gift from God? If you have never experienced the powerful Holy Spirit you need to beg God. The Spirit is truly a gift to us, and you are called to seek God with your entire heart, mind, soul, and strength. What an incredible statement! It was the time for Christ to be exalted; and it was the time for John to be brought low. John was fine with that – he lived for the Lord. He had no personal agenda. The day prior to Jesus' baptism, John said, “After me comes a Man who has a higher rank than I, for He existed before me.” (John 1:30). Taking these statements by John together, Jesus' lofty status is made clear. He is the eternal God, in who no one can match. No one can rise to his position as the Son of God. He was alive before us, and none of us are worthy to even be his slave. This is a great picture for all of us to see. Is the call on our lives not the same as John's call? Becoming disciples, don’t we have to decrease while Christ increases? Doesn’t Christ rank higher than us? Didn’t he come before us? Isn't he and his ways of greater importance than us and our ways? Of course, to all! Praise be to God. Jesus listened to his Father, even though what he was asked to do wasn't humanly reasonable (Isaiah 55:9). God takes baptism extremely seriously. He is with us, through this wonderful rite of his Church body. A real Christian will be wise to follow in the footsteps of Jesus, seeking to please the Father. Baptism doesn't save you, but it identifies you with the Body of Christ. Baptism should be held in high regard. Jesus commands his followers to baptize and disciple new Christians (Matthew 28:19-20). Jesus' baptism is our example. 1) Since the sinless Son of God was baptized, how important do you think baptism is in a believer's life? 2) Jesus' baptism was a turning point in his life. Was your baptism a turning point in your life? 3) What did John the Baptist mean when he stated that he needed to decrease while Jesus increased? After sharing this Bible study lesson on Facebook or Twitter below download your FREE printable Bible Study Lessons (pdf version): Jesus' Baptism, Lesson 2.06. Please Donate to GG.com. Special Note: I am grateful to my wonderfully talented friends at Big Book Media and Free Bible Images for the use of their pictures in this lesson.